The new school year is back in full swing complete with trying to cook quick, yet healthy meals for my family which includes two ravenous teens! Both of my kids are active in sports which includes some late evenings and occasional odd schedules. I try to sit down every Sunday afternoon with the calendar and plan out the menu for the week. I even post it in the kitchen so the kids can look ahead. I try to match up quick meals on those crazy, busy nights! I find it helpful if I keep my pantry stocked with a few of those items that can create that “emergency” meal if things don't go as planned! A couple of staples that I try to keep stocked are frozen veggies, assorted pastas, frozen boneless chicken breasts, Country Crock Original Spread, soup mixes, BBQ sauces and shredded cheeses. Various quick, complete dishes and side dishes can be created with just these few items! Country Crock Original Spread has become a staple in our fridge that I never run out of! It is a healthy alternative for recipes, buttering corn, pancakes, toast and even making my family their favorite garlic bread! These are just a couple of tips that work for my family. I am not big on routine take-out for my family so I find that a little extra attention to keeping things stocked and planned out helps to save money and keep us healthy! I came up with this fast, healthy recipe for a busy night! The recipe can easily be printed below in a printer-friendly format! Prepare this light and easy one dish pasta bake for those busy school nights using Country Crock Spread! Cook the pasta according to the directions on the box. Saute the chicken on the stove top until done in 2 tablespoons of Country Crock Original spread and 1 teaspoon of salt. After the chicken is cooked, transfer it to a large bowl. Combine it with 2 tablespoons of Country Crock Spread, envelope of vegetable soup mix, mushrooms if desired, broccoli and cheddar cheese. Drain and add the cooked pasta to the chicken mixture. Add 2 cups of low-fat milk to the pasta mixture. Pour into a a large casserole dish. I used a 10.5" x 14.75. Melt the remaining 1 tablespoon of spread in a bowl. Add the 2 cups of stuffing mix and 1/4 to 1/2 cup of Parmesan cheese. Combine with a fork. Spread on the top of the pasta mixture. Bake uncovered at 400º for 30 minutes or until topping is lightly browned and warmed through. This is a very light recipe! The great thing about this recipe is that it can be made in advance! My daughter had a varsity tennis match that afternoon so I knew dinner prep would make for a late night! I completely prepped this dinner that morning with the exception of baking it in the oven. I just covered it with plastic wrap and stored it in the refrigerator. It could even be made the night before! It is all ready for the oven OR the fridge if making ahead! All baked and heated through! I wanted to experiment with a lighter dish, but you could add your own spin on it with more cheese or the addition of canned soups of your choice. Everyone loved it! The best thing is that it makes enough for a crowd so we had enough for another night of leftovers! 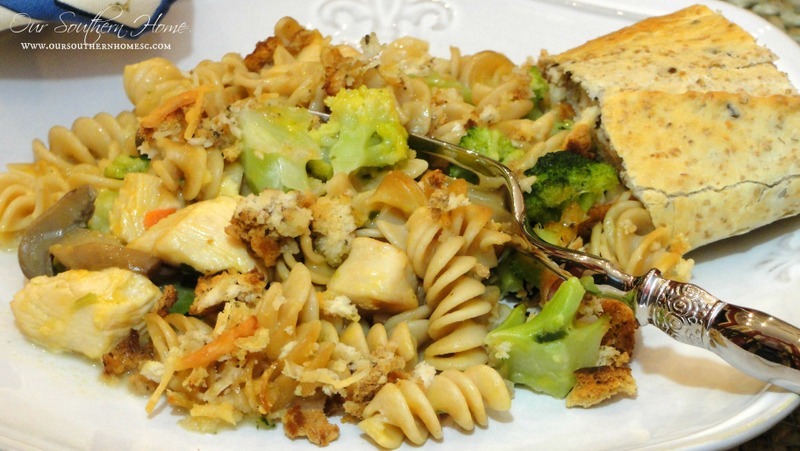 I don't know about you, but leftovers are great for busy school nights! I hope your Back-to-School year has been a great one! For other great recipes and tips be sure to follow the Country Crock Facebook Page and Country Crock Pinterest!!! Hi Christy! This sounds sooo goooood! I hope you don’t mind that I shared this recipe on my blog! We just might be having this for supper this week! Thanks!! Fell free to share with a link back here! Hope you enjoyed! Update: Charlie said it’s a keeper and Madison said it’s even better the second day! So glad you guys loved it!!! It is a favorite here too. I am all about the extra leftovers. I know it has been a challenge cooking in Germany! Not long and you’ll be home!!! Just cooked this tonight-to rave reviews from my girls! Charlie has a work dinner tonight, but he looked at the dish longingly on his way out. You are right, though-plenty of left overs for him and the rest of us for tomorrow night (and probably another two or three servings after that). I have to laugh at the “quickness” of the recipe, though. No such thing as frozen broccoli, shredded cheddar, or shredded parmesan over here (and it took me until Thanksgiving of last year to find some mild Irish cheddar). So, all of the broccoli cooking and shredding had to be done by hand. I have to say it was worth it though and I’ll be making it again. This looks delicious – I love broccoli in my casseroles! This looks so yummy! I am always looking for quick and healthy recipes. I am going to have to try this out! This looks great! I love Country Crock! That looks sooooo good! I am all about comfort food lately…must be the pregnancy hormones. 😉 Thanks for sharing the recipe! This looks so good! It’s wonderful to come home to a satisfying and delicious meal. It’s no fun when everyone arrives home .. hungry and Mom is scrambling around trying to put together dinner. Thanks for recipe!